Wait Till I'm Dead will be released on Tuesday, February 2nd! 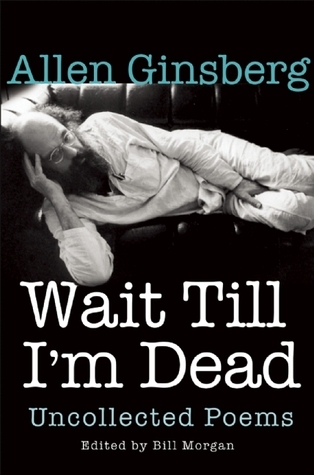 Wait Till I'm Dead by Allen Ginsberg, edited by Bill Morgan. Grove Press, 2016. 256 pages. Ebook. Allen Ginsberg has become one of the greatest influence in American poetry and has helped to define what we now call the Beat Generation. Bill Morgan, a distinguished scholar of Allen Ginsberg, has edited this new collection of poems written by Allen Ginsberg, the first publication of Ginsberg work in over fifteen years. When I first read Ginsberg, I found his work to be harrowing, compelling, uniquely perfect, and that description has stuck with me as I continue to enjoy his work. Thus, when I saw this collection on NetGalley, I knew I would be requesting it, and fortunately I was lucky enough to receive a copy. This particular collection is a rather sporadic and eclectic array of poems, including a variety of poems from the 1940s to 1990s that were "scribbled in letters or sent off to obscure publications and unjustly forgotten." Many of these poems were written spur of the moment or from memories and recollections of meeting certain people are random events he encountered. For instance, "The Real Distinguished Thing" is partly inspired from anesthesia laughing gas or nitrous oxide given to him during dentist visits. This "uncollected" group of poems is sure to be a welcome addition to any fan of Ginsberg, and I felt right at home delving into this unprecedented work. I didn't particular connect with every single poem, but each held a very special meaning and conveys Ginsberg's strong, distinct tone. Some are brief and subtle, yet have a powerful, clear statement, while others are much longer and convey the wonderful style of Ginsberg in its full glory with writing reminiscent of his greatest works. A few that stood out to me in particular were "A Night in the Village," "Thus on a Long Bus Ride," "Leave the Bones Behind," "War is Black Magic," "Busted," which reflects his drug use, and "After Wales Visitacione July," written under the effects of LSD. There are also a variety of notes at the back of the book which provide some context and background for many of the poems, which was extremely helpful and interesting. For those wondering if these poems are worth the read since they never made it into any collected works, they are definitely worth it. Overall, I can't help but give this book a full five stars for its wonderful collection of works and reintroduction into the life and work of Allen Ginsberg.